On the very last day of the last Dead Milkmen tour, Chris Peelout met milkman Joe Jack Talcum outside while a fire was being extinguished inside. A year later Chris showed up at Joe's West Philadelphia apartment claiming to be homeless and that night they wrote their first song together, eventually forming The Low Budgets along with Steve Please and Dandrew This. "Minimal effort equals maximum pleasure" is The Low Budgets credo and this Philly four-piece are serious about being laidback. 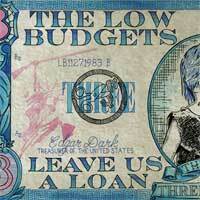 Songs about pizza menus, beer bellies, and "livin' la vida broka", Leave Us A Loan, with its Devo meets Descendents attitude, showcases the bands urgency to shake your booty while you save your looty. Viva la value-rock! This is a really great new full length from a good band. One of the Dead Milkmen are in this band. Check out the song "Fat Cop". A good 2007 release worth getting!